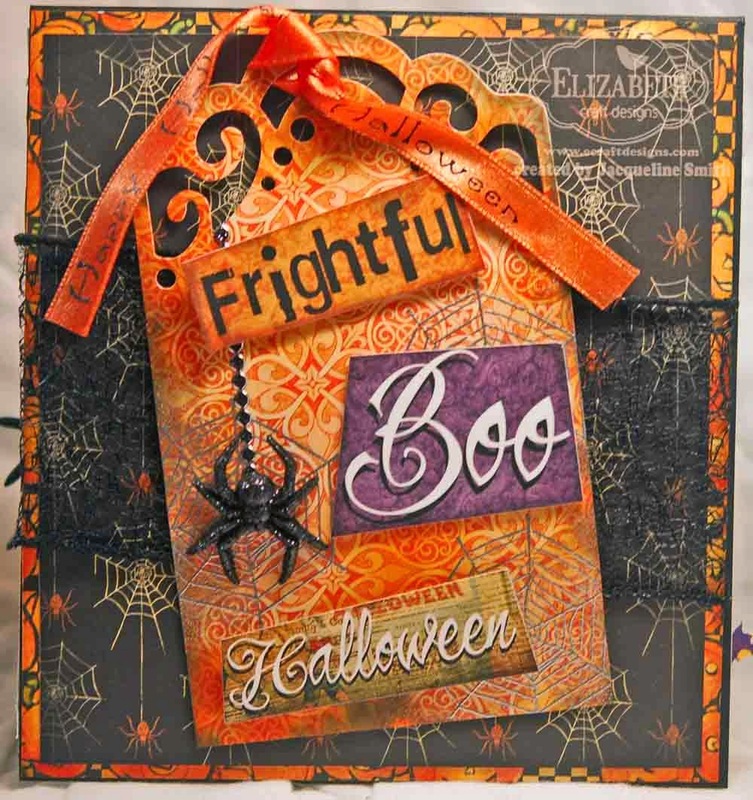 It's that time again my crafty friends, Elizabeth Craft Designs Monthly Challenge. This month's challenge is to make a card or project using Fall, Harvest, Halloween as a theme. So I love Halloween so I decided to do a Frightful, Boo, Halloween card. Karen Burniston did this really cool technique using Lorna Label Die so I decided to copy it. 1. Create card base from black cardstock. Cut 5″x 11″ rectangle; score and fold in half. In this card I’m using a double fold with an extra platform using the Lorna Label PopUp. Place the Lorna Label on the fold line as shown by Karen Burniston in this video. Cut another rectangle 5 1/4″x 12″ for the backing card. 2. To create a “back wall” and a “floor wall”, cut Trick or Treat and Spider paper 6″x 6″ square. Place Lorna Label PopUp on the edge of paper and die cut PopUp insert. You will need your scissors to cut out the Lorna Label insert completely. Do this on both papers. Adhere Trick or Treat paper to the top of the inside of the card and Spider paper to the bottom part of the inside of the card. Karen explains this step in her video as well. 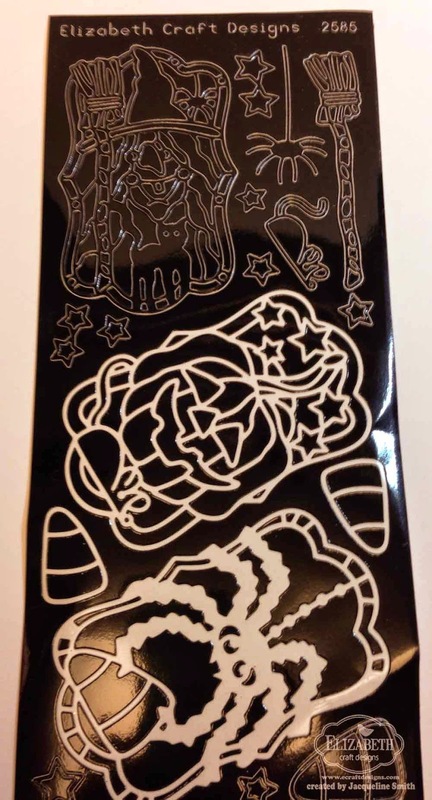 Cut Trick or Treat paper 2 1/4″ x 5 1/4″ and adhere to the bottom of the inside of the card. Cut out the sticker and popped it up using pop dots and placed on top as shown. Cut out Moon from Graphic 45 paper line. 3. Cut out 4 trees using black paper and the die from All Seasons Tree die collection. Take a white colour pencil to add markings as shown. Cut out grass using Green Velvet Adhesive sheet using Outdoor Edges die. Adhere grass as shown. 4. Cut out spider webbing using Spiral Circle from the Spiral Circle Pull card using white Crepe paper. I just weaved in and out thru the trees I stamped Ghosts and Bats using White and Black pigment ink and embossed with clear powder. Adhere using glue dots. I added a couple of extras around the spider as shown. I added a couple of 3D spiders. 5. Place black Halloween in Frame Peel-offs and an extra Candy Corn onto white cardstock with double sided adhesive on top. Cover Peel-offs with Cool Diamond Silk Microfine Glitter and polish glitter with your finger. Use a brush to brush of the excess glitter. Follow Els’ step by step instructions for this technique here. 6. Color Spider and Candy Corn as desired. I used Tombow Dual Brush Markers although they do require extra time to dry as they are water-based. Use alcohol-based markers instead of water-based markers if you prefer. Place the extra Candy Corn on top of the Spider holding the candy using pop up dots. I also added some boogie eyes to the spider. 7. For the front of the card, cut pumpkin paper 5 1/2″x 5 3/4″ and black spider paper 5 1/4″x 5 1/2″. Layer and adhere using double sided adhesive. Adhere black spider lace ribbon before placing paper down on black base. Cut out tag using the newest die from ECD called Tags & More 1 Lace.using orange paper. Stamp webs using white pigment ink and emboss using silver embossing powder. Adhere various stickers and 3D black spider using pop dots as shown. Adhere black Glitter Borders as shown. Add orange ribbon to front of tag. 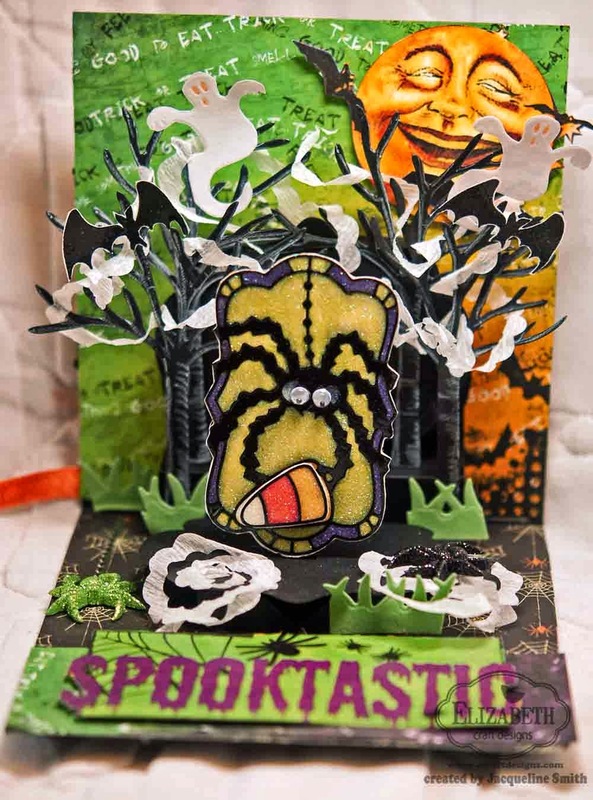 I had trouble with your link from the ECD page... Love the card - packed full of Halloween goodness! Fun!